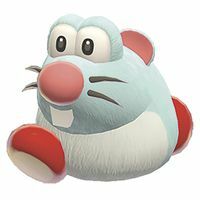 Skipsqueaks are mouse-like enemies that appear in the Wii U game, Super Mario 3D World. Their name is a portmanteau of "skip" and "pipsqueak". Some are stationary and some jog around in a set path, and can be defeated by any attack. However, Skipsqueaks have a good jump height which makes them dangerous enemies. The mice are usually found in groups of two or more. Skipsqueaks make their first appearance in the level Really Rolling Hills and make appearances in Grumblump Inferno and Rainbow Run. There is a subspecies of this creature known as Spiny Skipsqueaks which also appear in Cookie Cogworks and again in Rainbow Run. Skipsqueaks reappear as enemies that can be placed in Super Mario Maker 2 stages. This page was last edited on March 15, 2019, at 17:25.